Successful organizations whether being commercial, industrial, or institutional understand the importance of maintaining a clean look at all times. A perfectly clean facility doesn’t just mean a safer and healthier environment for their clients and employees, but also reflects positively on the image the business wants to present to the public. Maintaining a spotless image requires partnering with a professional cleaning service provider who is capable of providing clients with a comprehensive set of services including both general janitorial and specialty cleaning services: not every cleaning contractor has both the experience and the resources to be such a one-stop source. With over 30 years of experience in this field, Sunset Quality Cleaning is a multi-operational cleaning company that provides a full range of premium cleaning services that can be combined with our regular janitorial services. 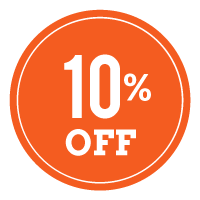 Those specialty cleaning services are carried out by a special team of experts and supervised very closely by our management. Depending on the cleaning requirements of your premise, our customer service managers will help you design a proper plan with one or more of our specialty cleaning services added monthly, bi-monthly, semi-yearly, yearly or whenever needed. There are many methods for cleaning carpet including: Rotary Shampoo, Carbonated Cleaning, Dry Powder, Encapsulation and Hot Water Extraction/Steam Cleaning. At Sunset, however, we recommend the use of two particular methods- Encapsulation and Steam Cleaning. Through out years of experience we found those two methods to give the best results without causing serious resoiling, damage to the carpet’s pile, or overwetting which causes jute straining, shrinkage and odor. Carpet cleaning should be carried out by professionals. It is not a job that should be taken lightly. 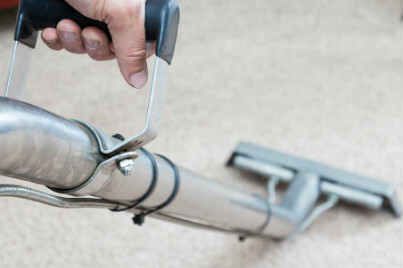 Inexperienced cleaning service providers may cause irrevocable damage to your carpet. The experts at Sunset Quality Cleaning are trained, experienced, insured and adequately equipped for your peace of mind. This system uses a special encapsulating compound which contains both a cleaning agent and a “crystallizing” agent. In this method, the encapsulated cleaning agent is worked into the carpet utilizing the agitation from a rotary brush machine. This action separates the soil from the fiber of the carpet and surround the soil particles with a polymer film which brittles upon drying and prevent soil from re-attaching to the carpet fiber. The resulted crystals of soil created will then be easily vacuumed away with a special vacuum. In addition, the polymer surrounds the fiber of the carpet and reduces the ability of soil particles to attach to the fiber in the future. This definitely results in cleaner carpet that will stay cleaner longer. Encapsulation is ideal for commercial applications because it dries quickly, it is more economical, and can be done during work hours since it utilizes quieter machines. While other ways are considered “light surface cleaning”, Hot Water Extraction is “Deep Cleaning” that is capable of removing soil deeply stored without the need of using any special agent in the pile after cleaning. In Steam Cleaning, a fine spray of solution of water and detergent is used to force dirt out of the carpet pile. The liquid contaminated with dirt is then sucked up by the vacuum slot fixed in front of the sprayer. This process is carried by either a truck-mounted unit or by a smaller portable system. At Sunset, we recommend a thorough carpet cleaning to be administrated once a year. Our professionals will help you choose the best plan of action according to your needs, type of carpet, and use. A mix of both techniques may also be used to grant the best results possible. Whether you require professional carpet cleaning services or if you require any other type cleaning and janitorial services, make sure to contact us today and one of our professionals will visit your premise and provide you with a free quote. Sunset Quality Cleaning provides general janitorial services and professional carpet cleaning services in the following cities: Kitchener, Waterloo, Guelph, Cambridge, and surrounding areas. Office, institutional, or commercial spaces with heavy foot traffic require a type of flooring that is both durable and cost-effective. Ceramic, porcelain, and laminate wood flooring, although can withstand such conditions, they may prove very expensive to replace in the future. Hence, many organizations chose to use Vinyl Composite Tiles instead. VCT is long-lasting and tough enough to handle areas with above average foot traffic. It also comes in different colors and designs that satisfy the aesthetic needs of the most demanding. However, after a long period of time, vinyl floors will start to lose their charm. If not mopped well, dirt and dust particles can cause tiny scratches on the surface of the floor. In addition, the use of inappropriate cleaning products and wet mops, over the years, will definitely hurt the aesthetic advantage of VCT. 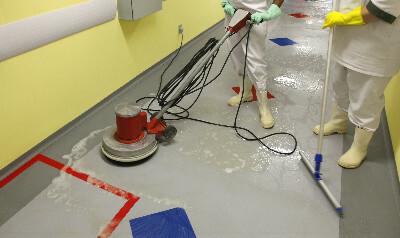 Luckily, VCT floors can be brought back to life and with the help of professional refinishing service, your floor could look as good as new again. Sunset Quality Cleaning’s experts are some of the best in business. Our team has helped many of our clients restore their floors and saved them thousands of dollars that could have been spent on unnecessary replacement. Our team will carry the refinishing process in a very short time. First, all furniture will be moved and floors cleaned removing all dust and debris. Floor stripper will then be applied to get rid of old polish on the surface. An auto scrubber, or a rotary floor machine, will be used to scrub the main floor areas. Edges with high finish build-up will be scrubbed manually. Floor stripper will be applied once again and floors scrubbed as in the previous step to get better results. Once that is done, and the floor is dried, the team will rinse the floor thoroughly and apply the floor sealer and floor finish of choice using micro fiber application pads. The area then is kept properly ventilated to allow for adequate drying. After the end of the process, your floor will surely look as fresh as new. Whether your floor looks outdated or if you require any other cleaning and janitorial services, make sure to contact us today and one of our professionals will visit your premise and provide you with a free estimate. Sunset Quality Cleaning provides general janitorial services and floor refinishing services in the following cities: Kitchener, Waterloo, Guelph, Cambridge, and surrounding areas. Sunset Quality Cleaning Inc. offers day porter services for busy facilities such as shopping malls, restaurants, gyms, public buildings, and companies with a large number of employees. 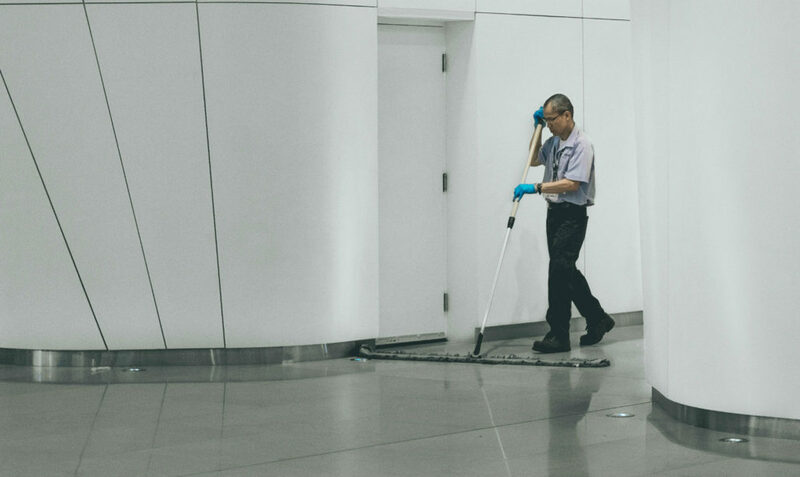 In addition to routine cleaning carried out by our general cleaning staff after business hours, a day porter will ensure a clean and professional appearance of your premise during work hours. Sunset’s day porters are background-checked, insured and uniformed with ID badges to ensure they represent our clients with the highest courtesy and professionalism. Availability for incidents such as spills, floods, etc. Sunset Quality Cleaning provides general janitorial services and day porter services in Kitchener, Waterloo, Guelph, Cambridge, and surrounding areas.